A thickened, aqueous detergent composition having an aqueous phase containing foaming surfactant, carrageenan and water. Conveniently, the carrageenan is at least half kappa or iota carrageenan, or a mixture of the two. This invention relates to detergent compositions for use in personal washing which are in the form of viscous aqueous liquids or soft solids. A number of detergent products for personal washing are formulated as viscous liquids, creams or gels. Examples of such products are hair shampoos, shower gels and facial washes. Such products generally contain foaming surfactant, which usually comprises at least 3 wt% of anionic surfactant possibly accompanied by amphoteric, zwitterionic or nonionic surfactant. It is conventional for such products to contain one or more ingredients whose function is to increase the viscosity of the composition. One possibility is to incorporate a sufficient quantity of electrolyte together with a sufficient quantity of selected surfactant, so that the surfactant is present in a viscous phase, and thus increases the viscosity of the resulting composition. A number of polymers of natural origin have the ability to increase the viscosity of water in which they are dissolved. A well known example is agar. A aqueous solution containing a small percentage of agar is a mobile liquid when hot, but when left to cool it forms a gel with sufficient rigidity to maintain its own shape. The formation of gels by natural polysaccharides arises from interaction between the polymer molecules. Above a temperature referred to as the gel point, this interaction largely disappears and the hot solution of polymer is mobile. When it cools below its gel point, the interaction of polymer molecules enables them to form a continuous and branched network which extends throughout the sample. This can be described as a network extending "from wall to wall" of the container holding the sample . Gel formation by aqueous solutions of natural polymers can lead to a wide range of physical properties. A so- called strong gel is sufficiently rigid that it cannot flow. When a sample is subjected to mechanical stress, it eventually breaks. A so-called weak gel is able to flow, and natural polysaccharides can be used to produce compositions which have the appearance of mobile liquids, albeit thicker than water. In contrast with the formation of a continuous, branched network, some materials which thicken water do so through merely local, transient entanglement of molecules. In the present specification, the expression "thickened aqueous composition" will be used to denote aqueous compositions with any viscosity greater than that of water. EP-A-271131 discloses a number of products intended for application to skin and thickened with carrageenan gels. Many of these do not include surfactant. One product disclosed in this document is a cleansing composition containing a nonionic surfactant which produces negligible foam. We have found that foaming surfactants cannot be incorporated into a number of gels formed by naturally occurring polymers. The surfactant makes the gel unstable and phase separation occurs. Xanthan gum can be incorporated as a thickener in aqueous compositions containing surfactant but the resulting products tend to have a stringy texture and a slimy feel which are not liked by users . By contrast, however, we have now found that thickened viscous aqueous compositions formed with carrageenan do not phase separate with foaming surfactants and can be used to form personal washing compositions which are in the form of viscous liquids or gels and have a good combination of consumer properties. Carrageenans are a class of polysaccharides which occur in red seaweeds. They are linear polysaccharides made up from alternating β-1,3- and α-l,4-linked galactose residues. The 1,4 -linked residues are the D-enantioner and sometimes occur as the 3 , 6-anhydride . Many of the galactose residues are sulphated. 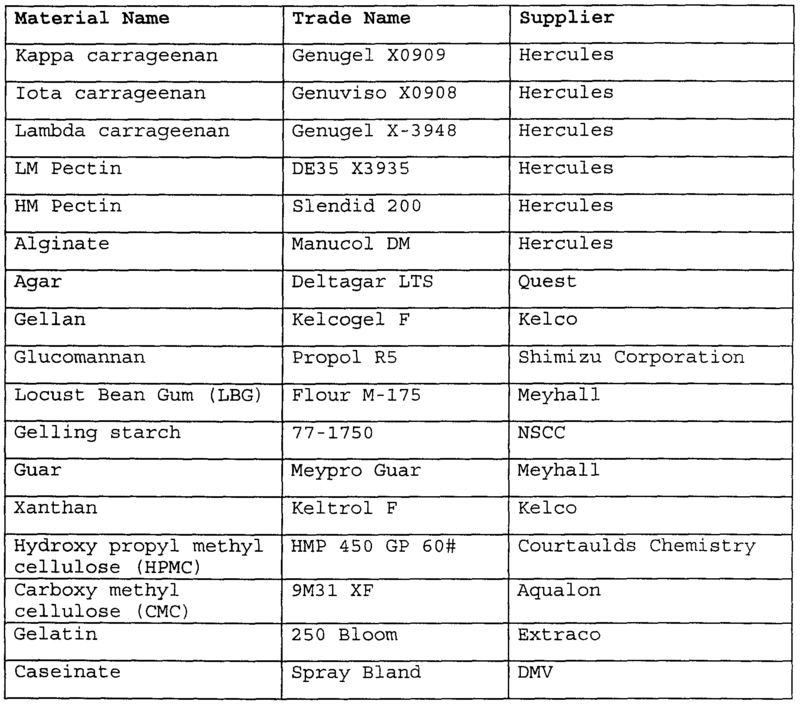 A number of carrageenan structures have been described and commercial materials are available which approximate to the ideal structures. However, variations between these structures occur, depending on the source of the carrageenan and treatment of it after extraction. A description of different carrageenan types is given in "Carrageenans" by Norman F Stanley which is Chapter 3 of "Food Gels" edited by Peter Harris, Elsevier, 1990. Kappa carrageenan is sulphated on the 1,3 -linked galactose residues, but not on the 1,4-linked residues. Iota carrageenan is sulphated on both residues. Lambda carrageenan has two sulphate groups on the 1,4 -linked residues and one sulphate group on 70% of the 1,3 -linked residues. Industrial treatment of lambda carrageenan with base can remove one sulphate group from some of the 1,4- linked residues: the resulting structure is designated theta carrageenan but does not occur naturally. Commercially available kappa, iota and lambda carrageenans consist predominantly of material approximating to be ideal structures mentioned above. Aqueous solutions of kappa and iota carrageenan exist as gels. Lambda carrageenan on its own in aqueous solution does not form gels because its molecular structure prevents association between its molecules and consequent structuring in liquids. Compositions of this invention contain carrageenan and surfactant in an aqueous phase. The carrageenan increases the viscosity of this phase, and in certain forms of the invention the carrageenan does this by forming a continuous network within this aqueous phase. Compositions of this invention may be intended for use as personal washing products such as shampoos, shower gels, facial washes, or hand cleansers. For this purpose the composition may consist solely of a thickened continuous aqueous phase or it may incorporate suspended particles of a liquid (eg a water- immiscible oil) or of a solid. The amount of carrageenan in a composition of the invention may be as low as 0.05% by weight of the aqueous phase of the composition, leading to a mobile, but thickened liquid. The amount may be higher, such as at least 0.1, 0.3 or 0.5% by weight. The amount is unlikely to exceed 5% by weight of the aqueous phase of the composition, preferably not over 4% or 3.5% by weight. A preferred weight range is from 0.5 to 2.5% especially 0.7 to 2.0%. A composition in accordance with this invention may have an appearance resembling a thickened but still mobile, self-levelling liquid. Alternatively, it may have an appearance which is more characteristic of a soft solid. It may be a soft gel, which breaks up easily when disturbed, but retains a lumpy appearance. It may be a firm gel, which can retain its shape during handling, although it can be broken up by application of force. In between, a gel may be elastic so as to distort under its own weight, but retain its shape better than a soft gel. It will generally be necessary to provide a sufficient quantity of carrageenan to provide ordering within the aqueous phase, and consequent thickening. Further increases in the amount of kappa or iota carrageenan tend to lead to increasing viscosity and/or gel strength, although the changes observed are not always linear increases in viscosity with carrageenan concentration. If kappa carrageenan is used alone, the compositions obtained are smooth, with viscosity which depends on concentration. Compositions with relatively small concentrations of this carrageenan have the appearance of mobile liquids but stronger gels are produced at higher concentration typically 1.5% by weight or more. kappa carrageenan produced a mobile, although thickened, liquid. It is generally true that increasing the concentration of kappa carrageenan, iota carrageenan or a mixture of them increases viscosity and/or gel strength progressively. As mentioned, lambda carrageenan does not on its own form a continuous network. Smooth thickened compositions without a continuous network can be obtained using surfactant and concentrations of lambda carrageenan which are large relative to useful concentrations of kappa or iota carrageenan. Lambda carrageenan can be used jointly with kappa or iota carrageenan whereupon it does contribute to the overall viscosity or gel strength. 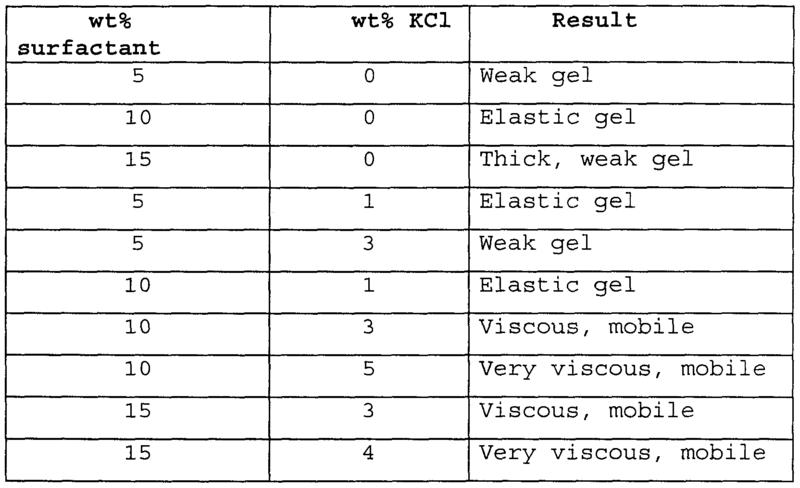 For instance, 1.4% of kappa carrageenan alone in a composition containing 10% surfactant produced a thick mobile liquid but adding 1.4% lambda carrageenan to this mixture produced a composition in the form of a soft gel which retained a lumpy appearance when an attempt was made to pour it . The viscosities of compositions containing kappa or iota carrageenan can be modified by incorporating a small amount of electrolyte. Addition of sodium ions, for example as sodium chloride, increases gel strength moderately. Addition of potassium or calcium ions gives a rather greater enhancement of gel strength. Potassium ions are particularly affective to increase viscosity of kappa carrageenan while calcium ions are particularly affective with iota carrageenan. 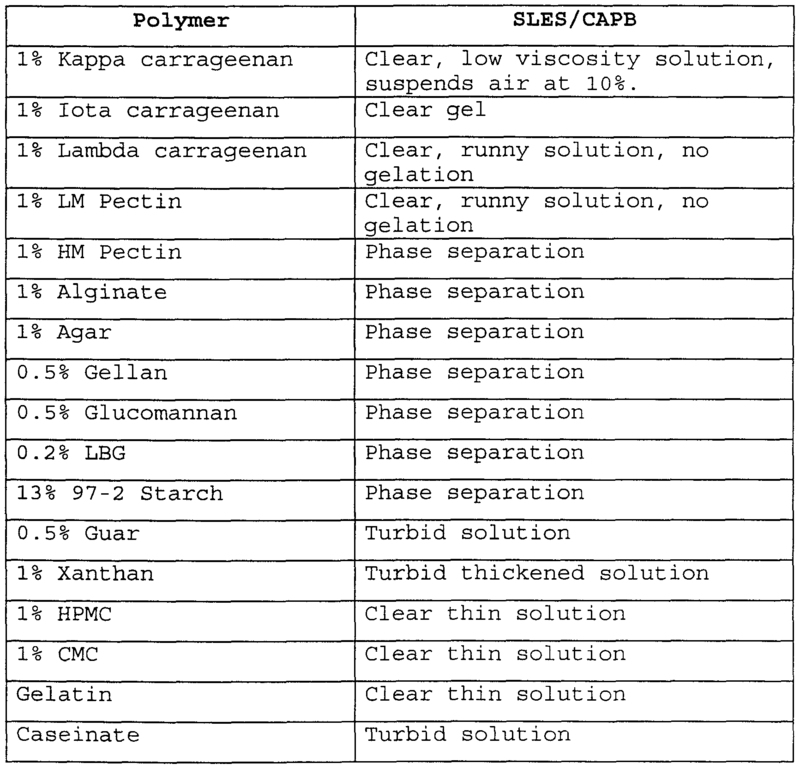 When selecting carrageenan type, concentration and accompanying electrolyte concentration, the nature of the thickened liquids/gels which are obtained can be investigated by producing a number of trial compositions as exemplified below. Commercial supplies of surfactant will generally contain some electrolyte as impurity and allowance should be made for this, for instance by carrying out trials using commercial surfactant from the source envisaged as supplier for subsequent manufacture. Compositions of this invention contain at least 3 wt% of a foaming surfactant system, preferably from 5 wt% up to 30 wt%. Ranges from 7 or 10% up to 15 or 20% are preferred. At least half, better at least two-thirds of all the surfactant present is preferably selected from anionic, amphoteric or zwitterionic surfactants, or nonionic surfactants other than ethoxylated fatty alcohols. Instances of such nonionic surfactants are alkyl glycosides (more specifically alkylpolyglycosides) , O-alkanoyl glycosides, polyethylene oxide-polypropylene oxide block copolymers, alkyl polyhydroxyamides (which may be referrred to as alkyl glucamides) , alkyl aldobionamides (notably including lactobionamides) and their mixtures. Preferably the composition contains at least 5% anionic surfactant possibly accompanied by amphoteric or zwitterionic surfactant. 4 where R is alkyl or alkenyl of 8 to 18 carbon atoms, especially 11 to 15 carbon atoms, t has an average value of at least 2.0 and M is a solubilising cation such as sodium, potassium, ammonium or substituted ammonium. Preferably t has an average value of 3 or more. Other anionic surfactants may be used. Possibilities include alkyl glyceryl ether sulphates, sulphosuccinates, taurates, sarcosinates, acyl isethionates, sulphoacetates, alkyl phosphates and acyl lactates. R5CONHCH2CH202CCH2CH (S03M) C02M; wherein R ranges from C8-C 0 alkyl, preferably C1 -C15 alkyl and M is a solubilising cation. 5 R CON(CH3) CH2C0 M, wherein R ranges from C8-C20 alkyl, preferably C12-C15 alkyl and M is a solubilising cation. preferably C12-C15 alkyl, R ranges from C1-C4 alkyl and M is a solubilising cation (such as those above) . Fatty acyl isethionates have the formula: R-C02-CH2CH2-S03M where R is an alkyl group of 7 to 21 carbon atoms and M is a solubilising cation such as those above. The anionic surfactant included in the composition will generally be selected to avoid harsh surfactant such as primary alkane sulphonate or alkyl benzene sulphonate. The amount, if any, of these is preferably less than 3% of the surfactants present. Anionic surfactant may be used jointly with zwitterionic surfactant, notably betaine or sulphobetaine . I R1 — N+ — CH2C02 "
2 3 to 14 carbon atoms . R and R are preferably methyl . R0(R'0)t (G)χor RC02 - (R'0)t(G)χ in which G is a residue of a pentose or hexose, R'O is an alkoxy group, x is at least unity and R is an organic hydrophobic group from 6 to 20 carbon atoms which is preferably aliphatic, either saturated or unsaturated, notably straight or branched alkyl, alkenyl, hydroxyalkyl or hydroxyalkenyl. Particularly, R may be alkyl or alkenyl of 7 to 14 or 16 carbon atoms. R'O is present, the value of t (which may be an average value) will preferably lie in the range from 0.5 to 10. The group G is typically derived from fructose, glucose, mannose, galactose, talose, gulose, allose, altrose, idose, arabinose, xylose, lyxose and/or ribose . Preferably, the G is provided substantially exclusively by glucose units. Intersaccharide bonds may be from a 1- position to a 2 , 3, 4 or 6-position of the adjoining saccharide . Hydroxyl groups on sugar residues may be substituted., e.g. etherified with short alkyl chains of 1 to 4 carbon atoms. Preferably a sugar residue bears no more than one such substituent. The value x, which is an average, is usually termed the degree of polymerization. Desirably x varies between 1 and 8. Values of x may lie between 1 and 3, especially 1 and 1.8. Alkyl polyglycosides of formula R0(G) , i.e. a formula as given above in which t is zero, are available from Horizon Chemical Company, BASF and Henkel . Alkylation in the 1-position enables such compounds to be prepared by regiospecific enzymatic synthesis as described by Bjorkling et al . (J. Chem. Soc . , Chem. Commun. 1989 p934) . Aldobionamides are amides of an aldobionic acid or aldobionolactone . Aldobionic acids are disaccharides or polysaccharides in which the aldehyde group (generally found at the Ci position of the sugar) has been replaced by a carboxylic acid. Upon drying they cyclise to aldobionolactones . The disacharide may in particular be lactose or maltose, so that the aldobionamide is a lactobionamide or maltobionamide . Further information about aldobionamides and their preparation is given in EP-A-550278. 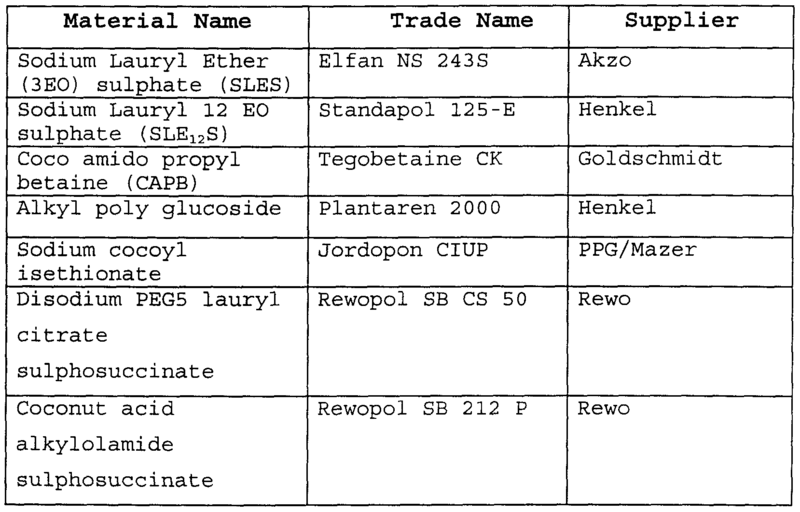 Descriptions of alkyl polyhydroxy fatty acid amides are found in US 2965576, EP 220676, EP 550557 and documents referred to therein. Polyethylene oxide-polyproylene oxide copolymers are marketed commercially, e.g. under the Trademark "Pluronic" . hands. The panellist continues to generate lather by rubbing their hands together for about 10 to 20 seconds until the volume of lather is perceived as constant after which the volume of lather on the gloves is measured by the panellist submersing their hands into a bowl of water while a calibrated collecting funnel is held above them so that the lather is swept off the hands into the collecting funnel. The results obtained from each panellist are averaged. A surfactant can be designated as a foaming surfactant if the volume of foam obtained is greater than 10 cm . An alternative definition is to state that the volume of foam for a foaming surfactant should be at least half the volume generated from sodium lauryl ethyl sulphate containing average 3 ethylene oxide residues. A number of surfactants were tested in accordance with the above procedure and the following results were obtained. SLES denotes soduim lauryl ether sulphate. This was Genopol ZRO containing average 3 ethylene oxide residues and supplied by Hoechst . CAPB denotes coconut amidopropyl betaine. This was supplied as Dehyton K by Henkel . APG denotes alkyl poly glucoside. The material used was the material supplied as Plantaren 2000 UP by Henkel. The alkyl chain has average 10 carbon atoms and the molecules contain an average of 1.4 glucoside residues. SCI denotes sodium cocyl isethionate supplies as Jordapon CI by PPG Mazer. Other materials may be included in compositions of this invention. Possibilities include colouring agents, pearlescers, opacifying agents, proteins, glycerol and other emollients, perfumes including deodorant perfumes, buffering agents, bactericidal agents to reduce the microflora on skin, antioxidants and other preservatives. 2 from l-3mm . A round hole of diameter 1.5mm has been found suitable, for example. Two surfactants were used; sodium lauryl ether sulphate, average 3EO, (SLES) supplied by Akzo as Elfan NS 243S and coconut amidopropyl betaine (CAPB) supplied by Goldschmidt as tegobetaine CK. containing 10% wt surfactant and a chosen concentration of polymer, usually 1% by wt . The mixed solution was left to cool, stored for 24-48 hours to allow gel formation to take place and then assessed visually. 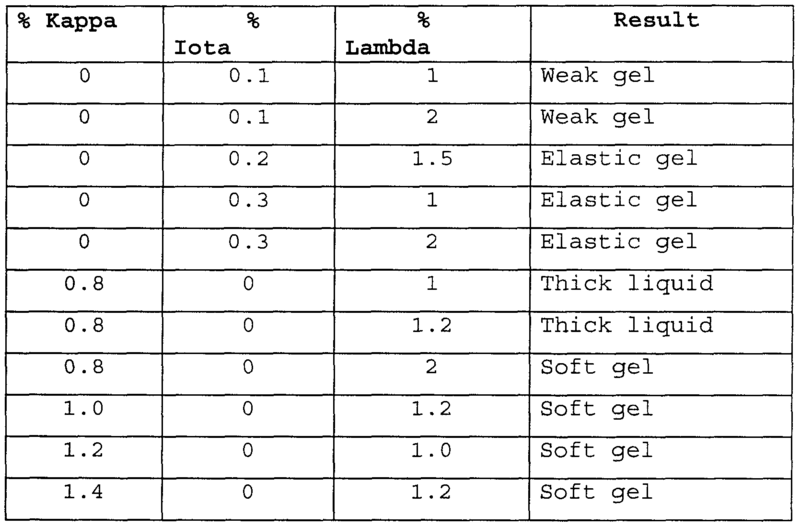 If a gel had formed the strength of the gel was assessed by tilting the container and/or disturbing the gel with a glass rod. 1% Kappa carrageenan Clear, low viscosity solution, suspends air at 10%. The procedure of Example 2 was repeated using 10% surfactant and various percentages of lambda carrageenan. A thickened liquid was obtained at concentrations up to 2.5% wt% carrageenan. Thickened compositions, generally in the form of gels, were obtained in each case. The gels were packed in 150ml translucent polyethylene tubes with 1.5 mm diameter outlets . These samples were assessed by 24 female panellists who were instructed to observe the visual appearance and flow of the products in the pack, then squeeze some of the composition from the tube onto a transparent plastic sheet and make a visual observation of the product, then feel the product with their finger tips. Subsequently they were asked to wash their forearms using each of the products . As a comparison the panellists were provided with a conventional shower gel in which aqueous surfactant was thickened by incorporation of salt. The panellists generally commented that the products of this invention were less sticky or stringy than the control composition and that when dispensed from the tube the dispensed material was less prone to slump under its own weight. (That observation can be attributed to the strongly shear thinning character of the products of the invention) . When used for washing the products of the invention were perceived as clean rinsing leaving no residue on the skin. They were observed to leave little or no residue or tackiness on the skin after drying. 1. A thickened, aqueous detergent composition having an aqueous phase containing foaming surfactant, carrageenan and water. 2. A composition according to claim 1 wherein the foaming surfactant is selected from anionic, nonionic, amphoteric and zwitterionic surfactants, and mixtures thereof. 3. A composition according to claim 2 wherein the aqueous phase contains at least 3 wt% anionic surfactant. 4. A composition according to claim 3 wherein the aqueous phase contains 5 to 20 wt% anionic surfactant. 5. A composition according to any of claims 1-4 wherein the foaming surfactant is selected from anionic, amphoteric and zwitterionic, and nonionic other than ethoxylated fatty alcohol surfactants, and mixtures thereof, and wherein the foaming surfactant makes up at least half of the total level of surfactant in the composition. 6. A composition according to claim 5, wherein the foaming surfactant makes up at least two thirds of the total level of surfactant in the composition. 7 wherein the aqueous phase contains in total from 7 to 20 wt% surfactant. 8 wherein the aqueous phase contains anionic surfactant with a lesser quantity of zwitterionic surfactant . 10. A composition according to any one of the preceding claims wherein the aqueous phase contains from 0.05 to 5% by weight of carrageenan. 11. A composition according to any one of the preceding claims where in the aqueous phase contains from 0.3 to 5 wt% carrageenan. 12. A composition according to any one of the preceding claims wherein at least half of the carrageenan is iota carrageenan, kappa carrageenan or a mixture thereof. 13. A composition according to any one of the preceding claims wherein the aqueous phase contains from 0.1 to 5 wt% of electrolyte other than surfactant. 14. A composition according to claim 13, wherein the electrolyte comprises potassium ions or calcium ions . 16. A composition according to any of claims 1-14, wherein the composition has incorporated solid or liquid suspended particles. 17. A pack containing a composition according to any one of the preceding claims, which pack subjects the composition to shear as it is dispensed therefrom so as to give the dispensed composition a smooth appearance. 2 closable outlet orifice with a diameter of l-3mm cross section. FR2939031B1 (en) * 2008-11-28 2011-01-21 Oreal cosmetic composition comprising at least one lambda-carrageenan type polysaccharide and mineral particles. FR2672899B1 (en) 1991-02-19 1993-05-28 Oreal KERATIN MATERIALS washing compositions synthetic oil base and óoeuvre formatting METHOD. FR2693733B1 (en) * 1992-07-17 1994-09-16 Oreal Cosmetic composition in the form of triple water / oil / water gel.